Welcome to the next section of your e-learning program, The Vision of MAGNETIC Sales & Marketing. To get the most out of this program follow these steps. Each step is a tab in the Table of Contents (TOC) below the list. Be sure to print the Activity Journal PDFs for each module to record your notes. If you want to watch only videos, they are listed inside the Videos tab. The PDF tab lists all the PDF Activity Journal links. [icon style=”print” color=”ff0000″]Click here to download your PDF Activity Journal. You may want to print it and save it in a 3-ring binder along with the other modules. Objective: Knowing your company’s Vision is a key element of your success. Using this information gives you a place to develop and shine as a valuable team member of your company’s success by using your unique gifts, skills and talents. Modules 1 through 3 worked with The Passion of Magnetic Sales & Marketing. We explored knowing yourself, knowing your customer, and knowing your Company’s brand promise. Modules 4 through 6 work with The Vision of Magnetic Sales & Marketing. We will explore knowing your company’s vision, knowing your personal success vision, and knowing your products and services. Some companies have a difficult time differentiating a vision from a mission – not just in wording, but in the concept. A mission is a statement of why an organization exits. A vision is a set of ideas that describe a future state. A good vision gives you a sense of inspiration and stretches the imagination. Most people don’t know their company’s vision or they don’t understand it. They may feel so disconnected from it that they can’t explain how it relates to their job. The vision should not be hard to understand – either for customers or especially for employees. In your Activity Journal, write the current Vision or goal for your company. A magnetic skill that supports you and your company includes making conscious choices of actions to support your company’s vision inside and outside of your company. To develop your magnetic energy within your company, you will want to find a place to align yourself with something important to you. Becoming recognized as a fully engaged magnetic team member happens when you are aligned with something you desire and value for yourself. This desire is often expressed by having a title, or certain rights and privileges. Perhaps it is your long term dedication to serve, or possibly to be seen for who you really are as you do what you do. How can you acquire and develop a passionate team membership experience inside your company while aligning to your company’s Vision? In your Activity Journal, check one alignment element that is most important to you. To develop your magnetic energy outside of your company, again you will want to find a place to engage with something important to you. Becoming recognized as a fully engaged magnetic team member also happens when you are aligned with something you desire and value for your community. This desire is often expressed by becoming active in community events to help others, or joining and becoming active in public and private peer groups. Building personal relationships is also a key factor to generate your magnetic energy. How can you engage in and develop a strong and effective team membership presence outside of your company to support your companies’ vision and keep your company in the public’s eye? In your Activity Journal, check one engagement element that is most important to you. Now it’s time for you to express and activate your company’s vision by achieving results in the area you have chosen to develop inside your company and outside of your company. Becoming a magnetic team member for your company’s vision happens when you make a decision to commit fully to align and engage yourself. You need to become involved with people and feel rewarded as you participate in activities that also support your desires, your passion and your values. In your Activity Journal, complete the sections listing alignment and engagement activities where you participate. In your Activity Journal, complete the MAGNETIC Sales Assessment for Module 4. Objective: Knowing and trusting your unique personal success vision is one of your most powerful assets. Your personal success vision gives you a target to focus on and a place to measure your progress. Now that you know who you are and what drives you, what else do you want? This module works with you as a whole person to become more magnetic. Great leadership success as well as great sales success always starts with a vision. Compelling visions can change the world. John F Kennedy famously dreamed of putting a man on the moon. We all have dreams when we’re young. But as we get older, people start to talk us out of them. We become focused on our limitations. It doesn’t have to be that way. Your personal success vision can begin with an imagined future or dream, a passion, and/or an expressed feeling. Your passion and your sales will excel when you are drawn to focus on several of the personal elements you really desire. When you use the word “imagine” to create your vision, it gives you permission to dream. When you add the feelings you are trying to achieve, this becomes a catalyst to empower your vision to be clear, accepted, and activated. When Visions become clear, they become possible. When Visions are accepted, they become real. 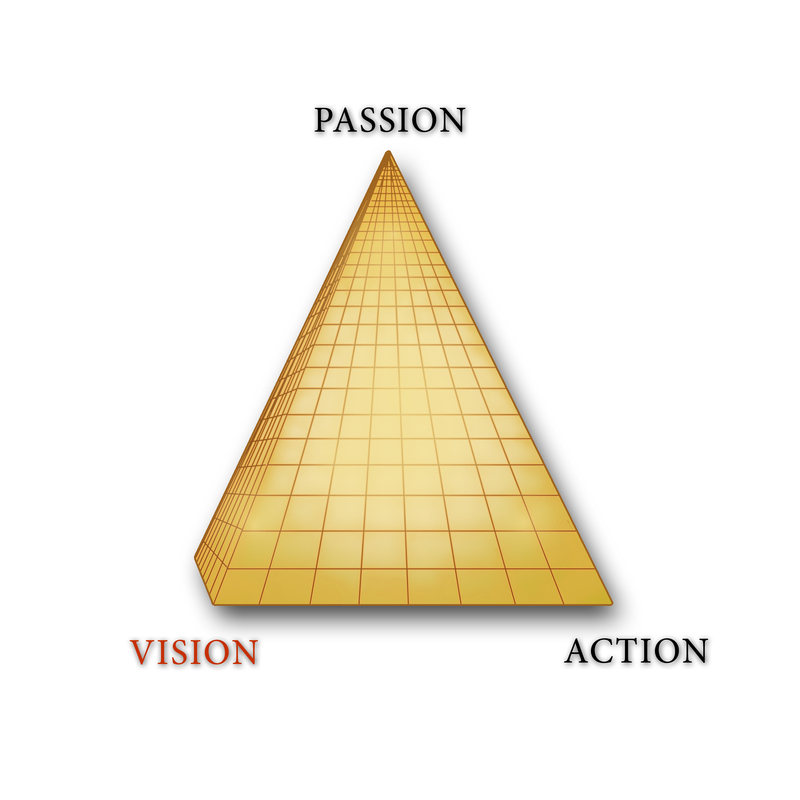 When Visions are activated with Core Passion energy, they become a measurable result. Remember, when creating your vision, you won’t know how you’re going to accomplish this vision. That will be revealed as you create the Passion In Action Plan and strategy to get there. The Vision just outlines what you want to create – not how you’re going to do it. Begin with the end in mind. . .
As you can see in the illustration to the right, everything you are connected to and everything you do is bridged in these quadrants of your life. 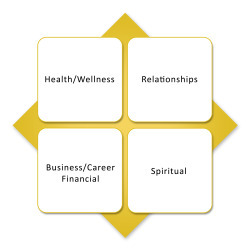 The quadrants include: Health/Wellness, Relationships, Business/Career/Financial, and Spiritual. The Core Passion® Focus 4 is a template for balance. When any of these areas of your life is out of balance (either too much or too little), it affects the other three quadrants. Such as, if your work life is over balanced and over stressed, it affects your health, your relationships and your connection to your spirit. In your Activity Journal, write what you want, need or desire in each area. How do you want to feel in each area? Use the Feelings Chart on the next tab to put words to the feelings you are reaching for as you accomplish your Personal Success Vision. Your Core Passion Codes play a powerful role in creating and manifesting your vision. Each Code is driving you by sending you a message of what it wants and desires. In the Magnetic Skill section, you wrote about what you want and how you want to feel. Now connect that desire to one of your top Core Passion Codes. When you understand WHY you want something, you can choose to use the energy of the Code that is driving that desire. Then use the energy to bring the Vision into manifestation and make it real. Use this template as a place to focus your future success. In Module 5 you learned that knowing and trusting your unique personal success vision is one of your most powerful assets. Your personal success vision gives you a target to focus on and a place to measure your progress. You explored the question, “What do you want?” You imagined your future working with all the parts of you. You also explored not only what you want but also how you want to feel in this personal success vision. You connected those desires to your Core Passion Codes to understand WHY you want something. The Magnetic Sales Assessment is designed to measure your level of belief about your personal success vision. To develop the knowledge and apply the skills, you must believe what you learned. If your total score for the Magnetic Sales Assessment is 15 or higher, you believe in your personal success vision and are aligned with magnetic energy. If not, go back and review Magnetic Skill and Passion in Action. When you’re ready, continue on to Module 6: Know Your Products and Services. Objective: Knowing your products and services inspires you to become an advocate and a believer for your company. With the knowledge of your products, tools, and services, you will believe the personal success Vision you have created for yourself. You have the confidence to share information that will give your customer the answers and solutions they require. This engaged expertise allows you to listen at the highest level of understanding. Your focus is then on the customer and the solutions you can provide for them. Demonstrating strong knowledge and expertise of your products is crucial for creating a positive customer experience. This creates faith and trust within your customer. You must understand your product so thoroughly that you can make it work for any customer. With in-depth knowledge, you can help a particular customer and offer a unique, personalized service that will impress them to buy! Ask any customer about what makes a great customer experience and they will usually mention something pertaining to genuineness, uniqueness and a human touch. Customers like it when they are treated like people. While listing your product’s features enables the customer to make an informed decision on their own, it can also leave them feeling a little overwhelmed with information. They may not be able to see what value the product will have in their own lives. You must be able to explain exactly how the product could make a difference to the customer – whether it will make them look better, feel better, happier, or make their business more profitable. This is where your knowledge and intuition about your customer comes in. Here is an example of what we are talking about . . .
“Within our company we have several products and services. We know, just looking at the list of these can be overwhelming. When we meet with a potential customer we enter into a conversation so we can “stand in their shoes” to listen and understand the results they desire. irst we ask lots of questions to better understand who they are. Next we direct the conversation to learn their desired outcome. Then we engage in a collaborative conversation to understand their budget and timelines. In your Activity Journal, identify your products and services, their value, how to create interest, and the promise you deliver. What’s the best way to get to know any product? By using it! We recommend that you go through the process of purchasing your product and try using it yourself. Stand in your customer’s shoes and see through your customer’s eyes. Live from their experience so you can bring a first-hand perspective to the customer experience. In your Activity Journal, reflect on your experience with your product. What did you experience in each of these areas as a customer? What did you expect would happen? What actually happened? What new insights did you learn about your product or service? In Module 6, you learned that knowing your products and services can inspire you to become an advocate and a believer for your company. This knowledge enhances your belief in the personal success vision you created for yourself. You now have the confidence to share information that will give your customers the answers and solutions they require. This engaged expertise allows you to listen at the highest level of understanding. Your focus is then on the customer and the solutions you can provide for them. You create an amazing customer experience. [icon style=”star” color=”ff0000″]Complete your Magnetic Sales Assessment for Module 6. The Magnetic Sales Assessment measures your level of belief about your products and services and the value and promise you deliver. If your total score for the Magnetic Sales Assessment is 15 or higher, you believe in your company’s vision and your connection to it. If not, go back and review the Magnetic Skill and Passion in Action section. When you’re ready, continue on to the section of Magnetic Sales & Marketing. You have finished the Vision of Magnetic Sales and Marketing. The next 3 Modules work with the Action of Magnetic Sales and Marketing. This is where you create your Action Plan and strategy to manifest your personal success vision. The Action section begins with Module 7: Know Your Timelines. The Adventure continues. You may want to print these for each module and add them to a 3-ring binder along with the other modules. [icon style=”print” color=”ff0000″]Module 4: Click here to download your PDF Activity Journal. [icon style=”print” color=”ff0000″]Module 5: Click here to download your PDF Activity Journal. [icon style=”print” color=”ff0000″]Module 6: Click here to download your PDF Activity Journal.